My passion for the Lamborghini Gallardo started when, in 2009, I drove this car on the Zandvoort circuit. I still remember the great sensations I had driving this supercar. I still have shivers when I think about that wonderful engine sound downshifting at the end of the main straight. A great day, difficult to describe and difficult to forget. I've been always very passionate about cars, and I always loved racing simulators on PC. 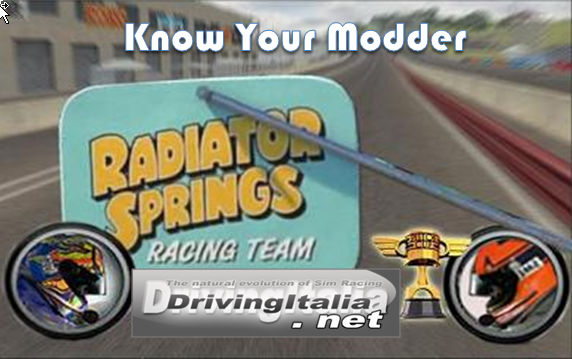 This passion became bigger an bigger in the last decade, and together with other friends, we created a team, organizing championships online, and creating a lot of nice, free mods such as scratch made tracks, or many other little modifications. Simulators nowadays can be really realistic, and more and more are used also by real life drivers. For me is just a nice hobby. I can have a lot of fun with friends and very good races online during the championships we organize. When in 2011 we finally understood that it was possible to build an additional car for our favourite simulator, netKar PRO, the decision was very easy: Lamborghini Gallardo Valentino Balboni. A wonderful car named after a remarkable test driver that worked for Lamborghini for over 40 years. Creating that car was truly a great challenge for us, but we wanted to make it justice, doing our very best to find real data for all physics parameters. To do that I've been studying as much as I could about suspensions, aerodynamics, engines, car handling, and so on, to try to recreate a credible physical model of that car for our simulator. It has been a long, difficult, but very rewarding process. We've been surfing the web and hunting for information about this car everywhere we can think of, finding a lot of technical details about this car, even on tiny parts. I've been really amazed on how many information are available, also due to the fact that this car is loved by many lucky owners, that are extremely passionate and very knowledgeable about their car. On top of that I've been in contact with several people that drove this car in real life, or engineers that work in this field to ask for feedback and suggestions to give me some hint on how improve the physical model or detect problems. From the other side, my team mates where working hard to build the 3d of the car from scratch and giving incredible technical support to be able to import the car in the simulator. In 2012 we've finally released our car to the community, free of charge, of course, just as we did for all other project we did in the past. It was great to see over 11.000 downloads of our car, and people having fun with the car we've produced. After few years, and tons on virtual kilometers done on that, car, we hear that a new simulator called Assetto Corsa in going to be released, created by the same developer of netKar PRO. This new simulator is even more advanced of the previous, and offers great support for additional car/tracks. Our team decided to push even further on the development of our Gallardo, getting onboard a professional 3d artist, Matteo Stirati, passionate for racing simulators just like all of us, and push even more on the physics to adjust to the new simulator. 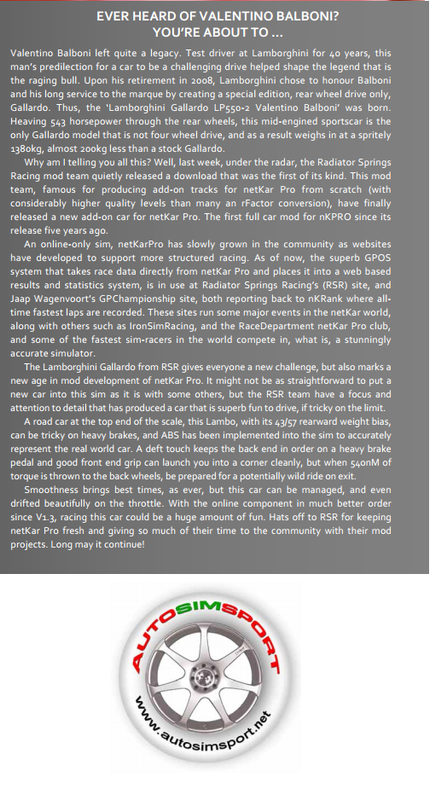 The new project was announced and immediately got a lot of attention on the main websites of simracing. Huge attention to details, and a lot or research to find detailed pictures was the key for our development. Lots of hours has been spent to create a very detailed 3d model (still a work in progress). Same attention to details was on the physical side of it, with continuous improvements on the model based on new data acquired, and deeper understanding of some concepts after reading several books and article on vehicle dynamics. We are pushing hard to recreate a model of the Gallardo as realistic as possible with our current skill set, and trying to improve it day by day. Any input or suggestions from more experienced people are more than welcome. This is the result of a project that is going on from more than 2 years now, that involve many people moved only by their pure passion for motorsports and simracing. We do this in our spare time, just for fun, with no commercial purpose, just as a celebration of this great car.